It's A Small World After All: Real Men Do Pinterest Too. If you've ever been to my house for longer than an hour or so, you've most likely witnessed a costume change or two by N. Sometimes it's to switch into pajamas, sometimes to put on one of her own sundresses in December, and often it's into a princess dress-up outfit. Whatever the case, there are almost always piles of clothes in the corners of rooms, or behind chairs, or underneath tables. I have to be vigilant about seeking out laundry not just in hampers. I've purchased bins to keep the dress up clothes and accessories contained, but nothing has really done the trick. A year or so ago, we had a playdate with a friend from school. There are three girls in that family, and they have an unfinished basement that serves as their playroom. 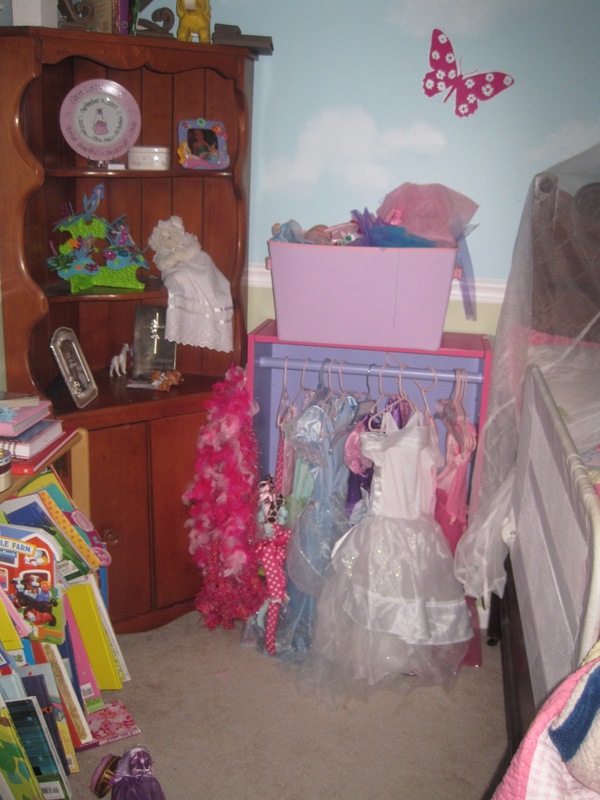 Along one wall, the mom had hung a closet rod between some storage crates, and all the dress up clothes were hung from hangers. This was pretty much N.'s idea of heaven. 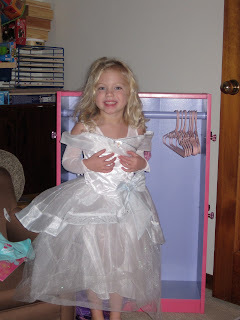 She kept asking when we could go back so she could play dress up, or when she could have her very own set up like this. Since N. has to share the toy space in this house with Playmobil animals, legos, nerf guns and assorted baby toys that L. does not play with, I could not see devoting quite the same amount of floor space to what amounts to a second closet. However, I did come across an inspiration project on Pinterest that looked like it might work. 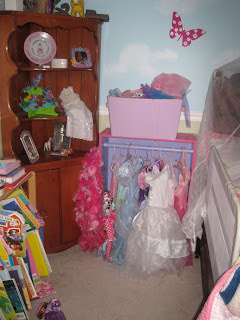 It was a super cute dress up space made by removing the drawers from an old dresser and installing a rod to hang the clothes from. You can take a look at the tutorial here. A friend also saw this project and took it on, posting her own very cute version on Facebook. We have no extra dressers lying around our house, but I found myself looking for them at Goodwill and the like. Then I realized what we DO have are extra bookshelves. The kind I bought at KMart back in the day and used in my classroom to hold all the novels that high schoolers pretended to read during Sustained Silent Reading. J. had recently moved one into the storage area of our basement when he got real furniture for his home office. I mentioned the project to J., sure that he would think me crazy, or tell me that we didn't need another item to feed N.'s quick change habit. But, turns out, the costumes all over the floor bother him even more than me. And he agreed to at least look into it. I showed him the inspiration photos and he remembered the one the friend had posted to Facebook. A little measuring and collecting of materials from his workbench, and the project started to take shape. And then he got a little obsessed with it. He made multiple trips to Lowe's for the proper colors of spray paint and sandpaper, searched out drawer pulls to mount accessories on the sides. He worked on it over his lunch breaks during the day, sanding and painting and mounting the dowel rod. He contemplated how to personalize it with stencils to read "Princess N." He drilled holes to install the accessory hangers, and finally inscribed it with a message on the back "To my Favorite Princess, Love Daddy." Needless to say, she was thrilled when she saw it on Christmas morning. Had to try on the new Cinderella bride dress right away. It's now installed on the one remaining open space of wall left in her bedroom. Can't say that she's particularly good at hanging everything up again when she's done, but at least everything has a home now. 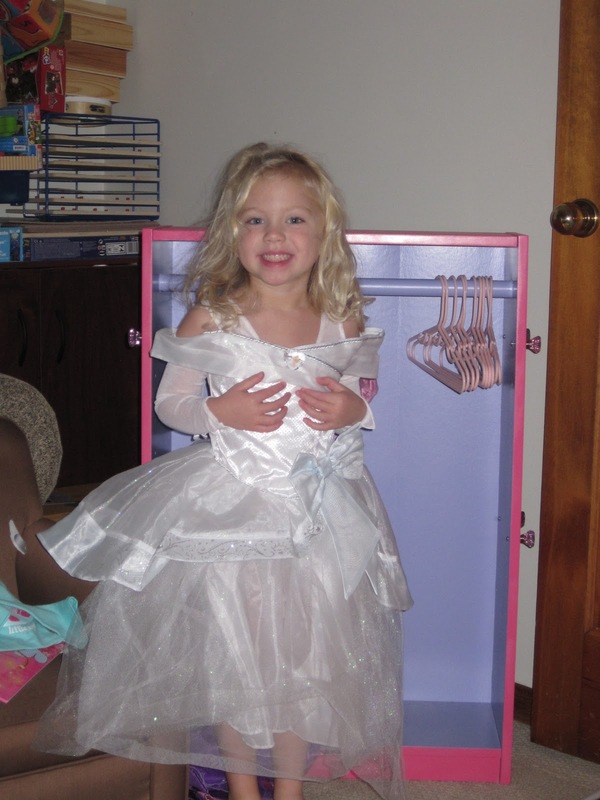 And she thinks she's pretty special to have her own dress up area in her room. J. may not be browsing the boards of Pinterest, but he's proof that Real Men can get on board with a crafting project, as long as it means making his little girl happy. Are you Pinteresting too? Seems I've gotten a lot of new followers lately! If you're interested in taking part in the Real Women of Pinterest, link up over at mep's place. Or send me your photos and I'll post them here. The finished project is adorable, but I don't love it nearly as much as I love thinking about J putting so much time and love into this gift for his Princess. Awesome. The hardware on the side for accessories? Genius! "To my Favorite Princess, Love Daddy." Heart ... melting. So, so sweet. And exactly what my own little costume-changer needs. Simply fabulous. And something she will remember FOREVER, guaranteed. That's a good man you have there! This is amazing, definitely something any little girl would love to have. Very, very sweet of daddy to make it for his princess!